This option should help when searching for guardianship cases. Often the Case Caption includes the name but the person is not listed as a Party on the case. For example, "In Re. the Guardianship of John Doe" where John isn't listed as a case party. Our case search for John Doe won't return that case. Searching John Doe in the new Case Title Contains field will. We hope you'll find many more uses for this new tool. Please don't hesitate to call us at 866-369-7671 with any questions. We also like to hear your suggestions, so feel free to offer those as well! 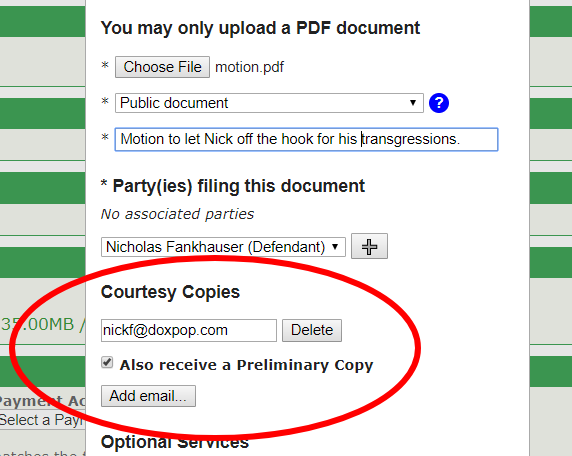 Courtesy copies for documents, allowing you to send a copy of any document you file to any person with an email. A common use for this would be to send a copy of the document you are filing to your client or any other interested party who is not a service contact. 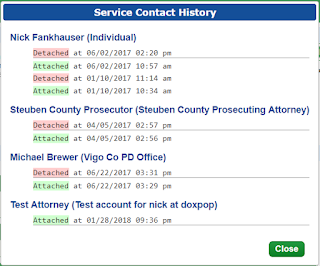 Service contact history allows you to see when each service contact was attached to or detached from a case. 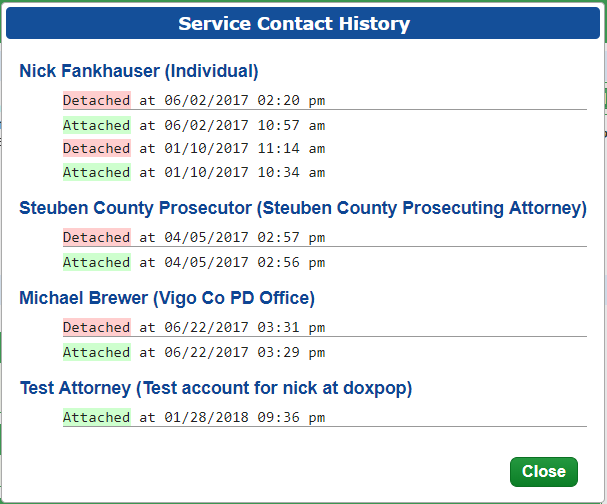 This is useful when a question about service arises and you need to know whether a particular person was attached when a document was filed. Courtesy copies may be sent for any document. Specify email addresses for as many people as you wish in the area just below where you specify the party filing the document. By default, these people will receive the file-stamped copy when the document is accepted. If you also want them to receive the un-stamped document immediately when you file it, check the box next to "Also receive a Preliminary Copy."